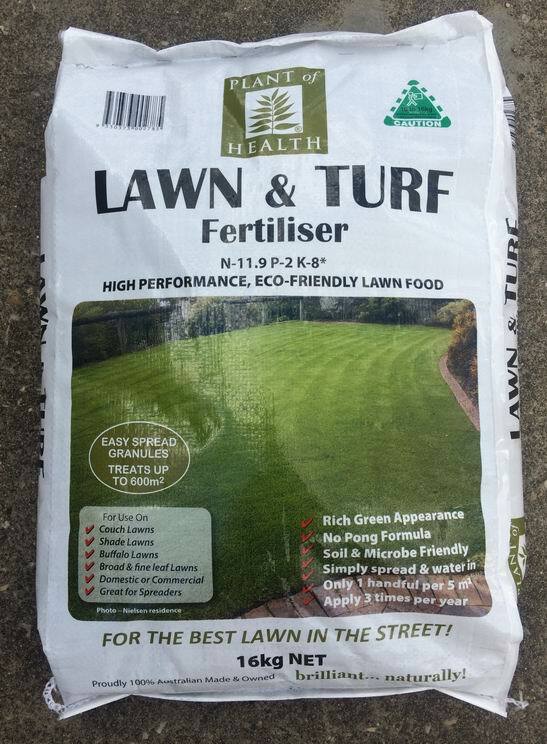 PLANT of HEALTH” LAWN & TURF FOOD Biologically enhanced eco friendly 11.9N 2P 8K* Granulated Fertiliser 16Kg covers 320 - 600 sqr metres Eco- friendly “Plant of Health” fertilizer especially designed for turf. Healthy soil & turf is a management of mineral balance, soil organic carbon & soil biology and our Lawn & Turf food is designed to support all areas. We recognised the need for a high performance granulated fertilisr while continuing our path towards more environmentally responsible practices. Plant of Health Lawn & Turf food takes conventional nitrogen in a, plant available, ammonia form & blended it with organic compounds & humates to give you a product that has enormous plant nutrition, coupled with minimal leaching and excellent up take. The organic compounds and massive 6% carbon content, buffer the NPK & support soil fertility, while a range of natural inputs delivers complete nutrition to the plant. Guano, from ancient seabird droppings, is added for plant & root strength, with volcanic rock & silicates added to retain moisture, nutrient & microbes at root level. Added Trace Elements ensures luxury uptake of minerals maintaining mineral balance & plant health. Lawn & Turf is low odour & easy to spread making it suitable for domestic or commercial use & is ideal for Home use, Sports Fields, Turf Farms, Golf Courses, Bowling Greens and Parks. NOW Lawn & Turf has been further improved by the addition of beneficial MICROBES including genera from the Mycorrhiza & Trichoderma species. These, all important, beneficial microbes have a symbiotic relationship with plants and soil where they help build soil fertility and assist with supplying of nutrients to their host plants. They also may assist in helping protect plants & roots from pathogens, pests and assist with healthy root growth. -- Will not burn when applied at the recommended rates. -- Help put carbon back into the soil. To be used as part of a balanced nutrition program. Soil Nutrition Diagnostics™ available to determine specific requirements. Turf Nutrition Programs Available. Apply autumn, spring & summer or when a boost is required.